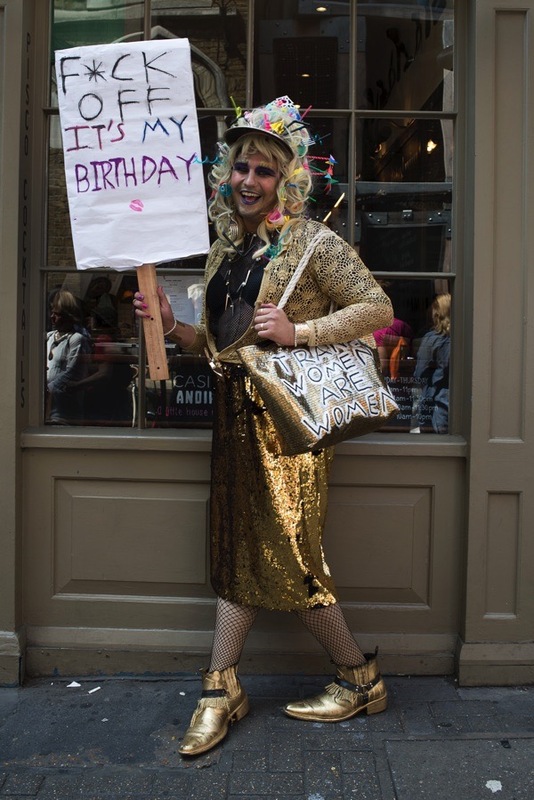 Contributing Photographer Sarah Ainslie & I were thrilled to go down to Soho on Friday to rendezvous in Great Windmill St with the celebrated Cheddar Gorgeous, who had just arrived from Manchester to convene a multifarious gathering of drag artists that she was leading in a protest against Donald Trump. 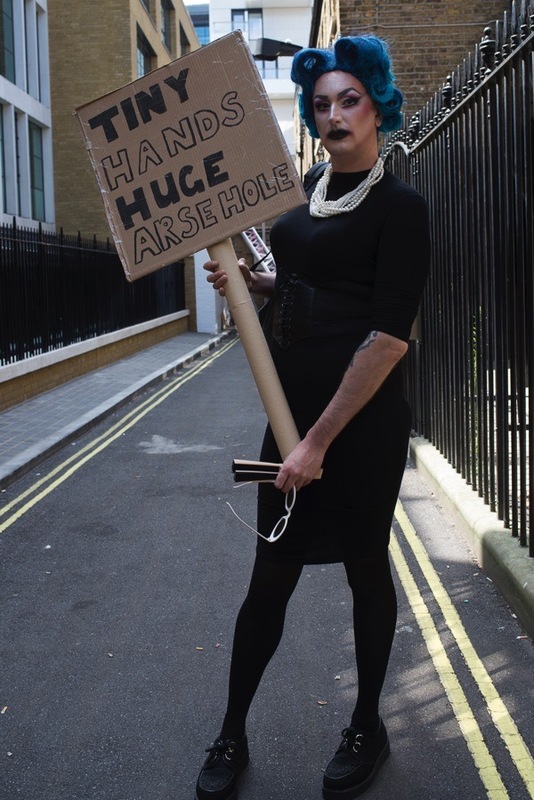 Despite the festive atmosphere, the purpose of the day was a serious one and, when the drag artists posed for their portraits, many assumed their most pugnacious expressions. 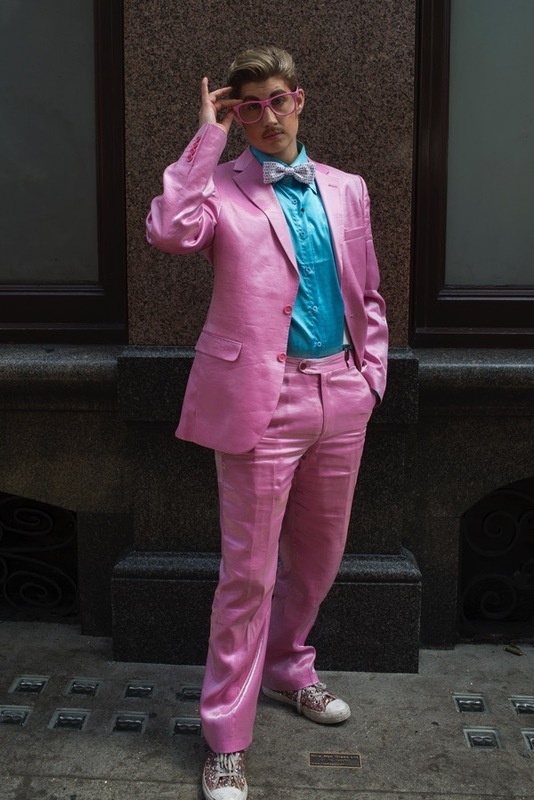 Yet all broke into the sweetest smiles when I congratulated them on their outfits, before I enquired what they might say to Mr Trump if they were to meet him. At one o’clock, in three-inch heels and with a face painted like Grimaldi, Cheddar Gorgeous led her forces in triumph out of Soho and into Shaftesbury Avenue beneath a dazzling sunlit sky. 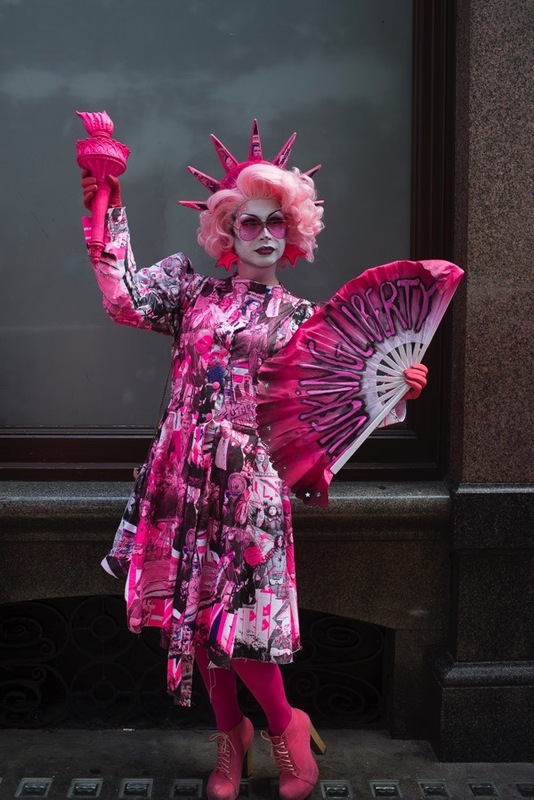 Demonstrating a sense of leadership worthy of Henry V, she advanced to Piccadilly Circus as a great cheer arose from her excited throng of followers and passers-by applauded in delight. They encountered more joyous clamour from the direction of Regent St as the main march arrived to meet them, filling the circus with a euphoric cacophony, and the two columns became one as Cheddar Gorgeous led the entire retinue off down the Haymarket towards Westminster. I stood in Piccadilly Circus and watched the parade pass for the next hour. I found it an emotional experience to witness the crowds from every walk of life who had come together to assert their belief in a decent society. Despite the grim circumstances, it was one of the most hopeful displays of humanity I have witnessed and I shall not forget it in a long time. Writing from New York State and my heart goes out to all the demonstrators in England today. The clothes and the comments are fabulous, these really are artists. 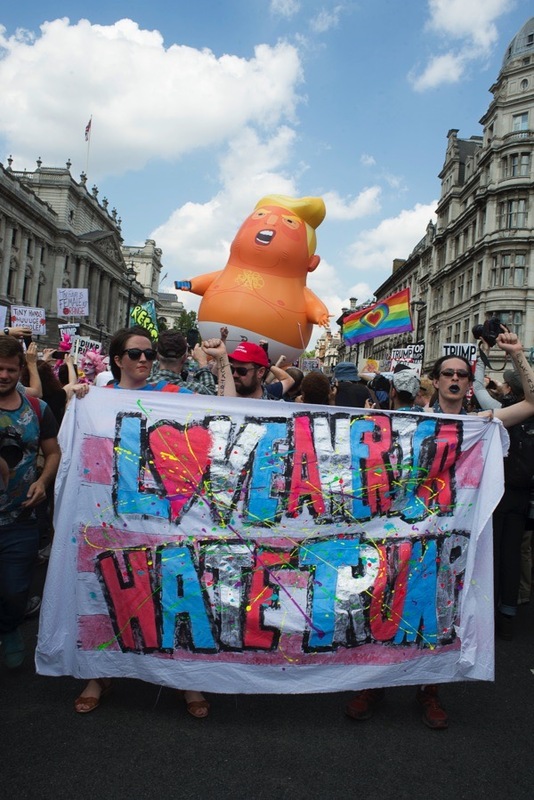 England has shown the U.S. how to do a beautiful, creative political demonstration and I suspect the model will be followed here. 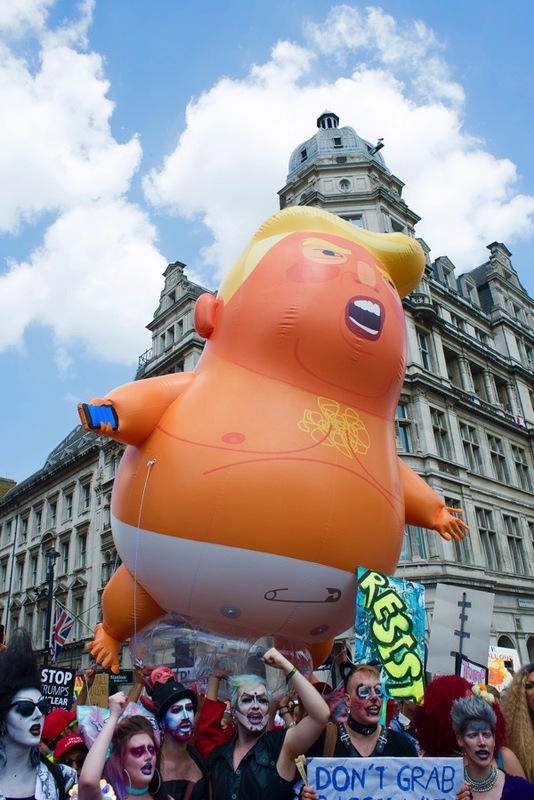 I hope the blimp will be transported to the U.S. for demonstrations, smaller versions could be taken to political rallies all over the country, balloons could be made in the shape of the baby. This day is special and to be remembered. Thank you, GA, for bringing this to your GRs. I love all of the photos and I heartily agree with the sentiments! I live in Manhattan and I’m glad that our vile “president” is seldom here…. Dear Gentle Author – You are a ray of sunshine in our daily lives. But not on this occasion. If you want to understand why Trump was elected – yes, elected – read “Hillbillies” by JD Vance. give me hope! Thank you from California. I wish the best for you and us all! GA that’s what I like about Spitalfieldslife anyone can ‘have a go’ no hang ups here. John a Poet, The Poetry Society, on the road with Bus Pass Poets. It was an unbelievable, overwhelming and emotional experience to take part in the march and rally in Trafalgar Square on Friday. Cheddar Gorgeous and the drag artists looked amazing so I followed the link above to CG’s Instagram page, Wow. Fantastic! So Proud of You All and To All You Ladies for facing up to that useless insulting ego maniac – Donald Trump by showing him and the world ‘diversity’. 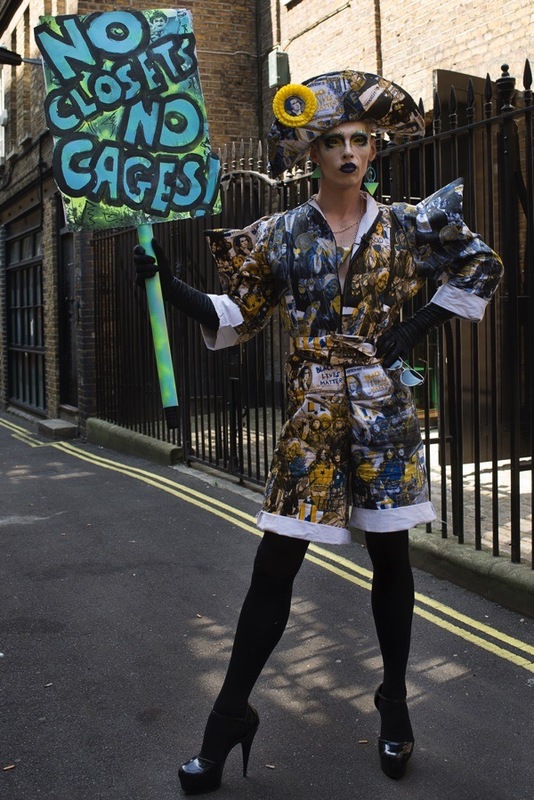 Absolutely adore your fabulous outfits and acerbic messages to ‘He Who Is An INSULT to HUMANITY’. I cried in disbelief when after thousands of us voted against his visit, our government not only allowed that ‘Derogatory Blot On The Landscape’ into our Country, but also have tea with and insults our Queen; which was beyond belief. Though the reality is, it is important we keep our friendship with our allied US friends and not allow that spiteful jumped up moron to destroy all that we have acheived previously and over two World Wars. So I thank all of you who Stood Up & Spoke Out! Chronic pain prevented me from being able to take part in London and my only consolation is; that one day ‘The Bleached Leach’ will be gone and that day can not come soon enough. 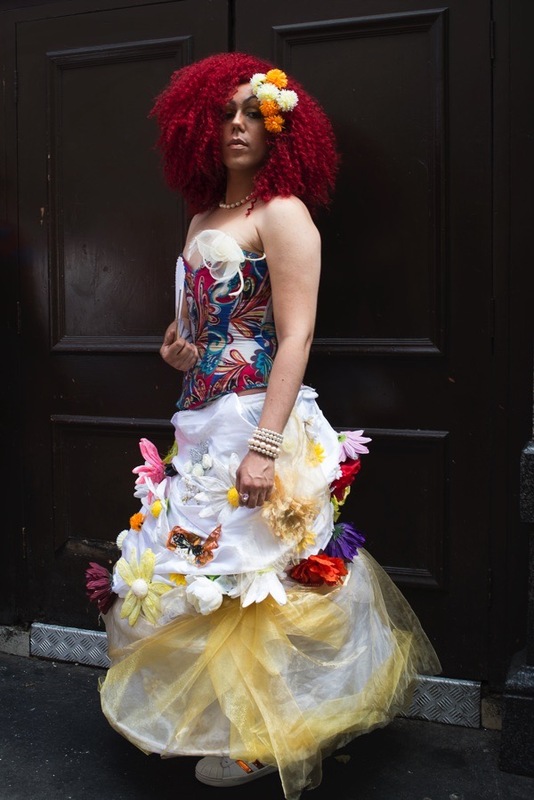 Wonderful outfits and great photographs, well done Sarah for the photos and well done to everyone who took part. Normally I would agree with a previous comment re foul language but on this occasion it really was deserved, this man is so obnoxious and to see our PM almost curtseying to him and holding hands yet again is the thing that makes me feel sick. How much lower can we sink. Wonderful! USA – this is how to protest against a racist, bigoted, authoritarian buffoon. Hello TGA: This blog & photos are spot-on, and for all Americans. Love this post & the photo’s. A great response to the tyrant of the world. 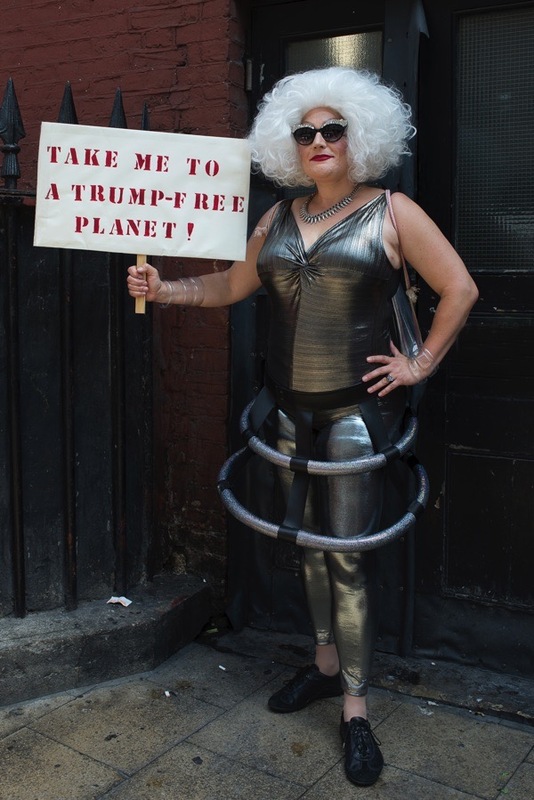 I wonder if (like J Edgar Hoover was) Trump is a closet drag queen? Are Trump & Putin meeting in private so they can exchange make up tips? 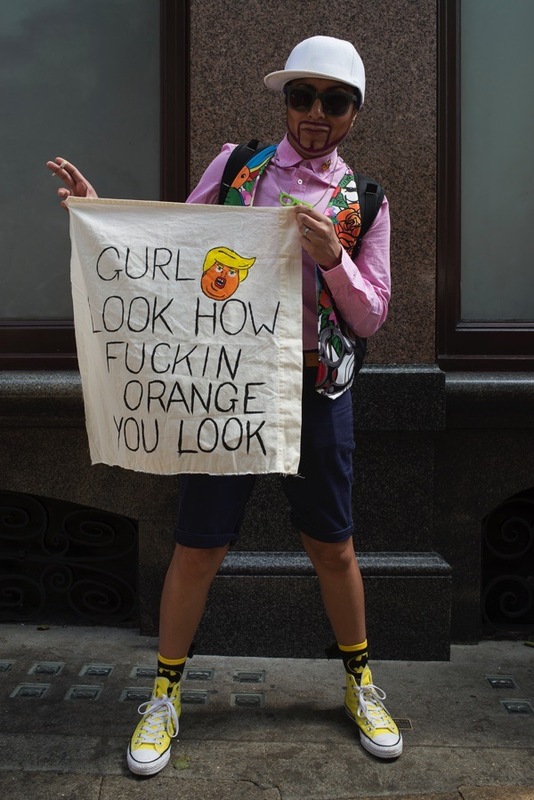 Thank you to every single person who protested Trump’s visit in the UK. The creativity and diversity were inspirational. It sparked hope in all of us over the pond who live with and dread this tyrant’s hideous behavior every day. I am very disturbed by everything Trump says and does as I think he represents the very worst impulses of humanity, but I worry that, in severe opposition to his values(and my ever growing anger about his policies (the separation of parents and children being the to date low point for me) ), we run the risk of stooping to his level by embracing the kind of rhetoric he engages in our protests we play into the hands of his supporters. His election was part of a very disruptive and disturbing trend facing liberal democracies. I applaud the level of protest and felt for your PM and the queen having to deal with him. thoroughly enjoyed the varied comments above. actually is. The fact that he is a foul-mouthed bigot is undeniable and his terrifying screed of “America First” is just as offense over here in the States as it is in the rest of the world. I’m proud of the fact that we fought together to defeat that fascist Hitler. And I thank you from the bottom of my heart for helping us to defeat the fascist tRump. This American says: AWESOME! Thanks for the support! I just read this post today, and it really warmed my heart. I am also a citizen of the USA and I am so thankful for all the people who are standing up for what is right. To the good people of London, please accept a heartfelt thank you, from me as well as many countless other Americans, for giving a voice to the many people President Trump and his administration want to marginalize. I really enjoyed these pictures. As an American- I more than support and feel the sentiments of these beauties. I am embarrassed by Trump and all who support him. I have taken a break from all news because it was so affecting my emotional health. I find that doing so not only makes me feel better but helps me to have hope by seeing good and trying to be of service to others. He cannot be allowed to divide! I am sorry U.K., world.